Pet Therapy Dog-‘Cash’ will visit with owner/trainer/volunteer Renee Laflamme. ‘Cash’ is a white and black, 50 lb., 2 year old Portuguese Water Dog/Poodle looking for children to read to him. 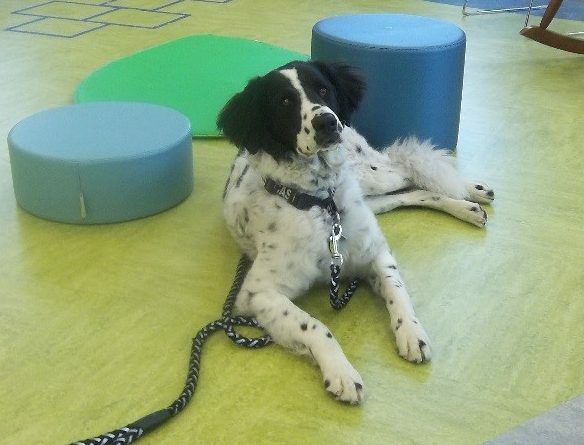 Cash was trained through Therapy Dogs International and has been an active therapy dog visiting Ronald McDonald House in Providence and Sacred Heart Nursing Home in New Bedford. REGISTRATION REQUIRED. To register-visit the Children’s Library or call 401.625.6796 ext. 3.